A story of food and love, injury and healing, Keeping the Feast is the triumphant memoir of one couple's nourishment and restoration in Italy after a period of tragedy, and the extraordinary sustaining powers of food, family, and friendship. Paula and John met in Italy, fell in love, and four years later, married in Rome. But less than a month after the wedding, tragedy struck. They had transferred from their Italian paradise to Warsaw and while reporting on an uprising in Romania, John was shot and nearly killed by sniper fire. Although he recovered from his physical wounds in less than a year, the process of healing had just begun. Unable to regain his equilibrium, he sank into a deep sadness that reverberated throughout their relationship. It was the abrupt end of what they'd known together, and the beginning of a new phase of life neither had planned for. All of a sudden, Paula was forced to reexamine her marriage, her husband, and herself. Paula began to reconsider all of her previous assumptions about healing. She discovered that sometimes patience can be a vice, anger a virtue. That sometimes it is vital to make demands of the sick, that they show signs of getting better. And she rediscovered the importance of the most fundamental of human rituals: the daily sharing of food around the family table. 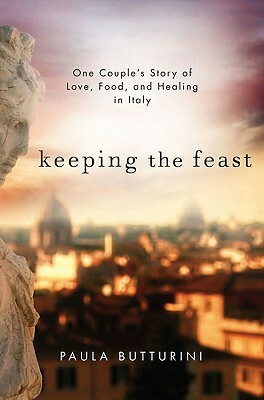 A universal story of hope and healing, Keeping the Feast is an account of one couple's triumph over tragedy and illness, and a celebration of the simple rituals of life, even during the worst life crises. Beautifully written and tremendously moving, Paula's story is a testament to the extraordinary sustaining powers of food and love, and to the stubborn belief that there is always an afterward, there is always hope. Paula Butturini has worked in overseas bureaus in London, Madrid, Rome, and Warsaw for United Press International and "The Chicago Tribune." She is now a writer based in Paris. "When we find ourselves coping with pain, the kitchen can become our therapist, food our source of comfort. The joy of cooking was certainly the salve that soothed the emotional wounds that the journalist Paula Butturini endured. . . . [A] blunt and brave memoir." "In this moving account . . . Butturini describes how she turned to the familiar comforts of preparing meals to maintain control as her husband spiraled into darkness. . . . Feast is a reminder that food sustains not only bodies but souls as well." "Her account of Tagliabue's shooting and near-death brings tears to the eyes." "It is a celebration of the human spirit, persevering in the face of overwhelming obstacles, and a paean to the restorative ability of food to bring comfort and peace to our souls as well as our bodies." "Bringing out the sights, scents, and tastes of Italy, she delicately and expertly simmers together memories of violence, pain, and depression with stories of hope and love. . . . Butturini's writing about Italy, food, family, and friends will appeal to readers of travel memoirs; her treatment of injury and illness will provide inspiration to those who seek healing; and her straightforward accounts of the turmoil during the fall of the Soviet bloc will interest those who enjoy history and politics. Highly recommended." "If food is love and love heals, does that mean that food heals? Paula Butturini proves the equation in gorgeous yet unadorned prose. I will never, ever forget this book." "Written with grace and courage, Paula Butturini's Keeping the Feast is about the endurance of love in the face of overwhelming odds--depression, tragedy, loss. But it is also about the comfort to be found in the dailiness of life, when every humble act becomes an act of faith; when the preparation and sharing of three good meals a day, however simple, is both a reminder and a celebration--an insistence on celebration--of what life offers. Keeping the Feast is a triumph of will and spirit. It made me hungry for everything." "Keeping the Feast is a remarkable story, gorgeously told. We reflect, relish, grieve, and heal our way with Paula Butturini, who is wise about so many things-family and place; depression, religion, and love; the disastrous long-term fallout of a single bullet fired at a loved one; and the immediate restorative pleasures of a single Italian meal. This book evokes life at its most serious and dire, and at its most mysterious and delectable. Read it, and be deepened and refreshed."